Last edited by Iori Branford on Sun Jan 13, 2019 6:27 pm, edited 21 times in total. Backgrounds and sprites look great, looking forward to something playable! Cute concept! Sprite work looks great too. Will be following this one for sure. The art is almost all opengameart.org, so I don't know if it will all make it into the final game, as the licenses are quite mixed and in some cases uncertain. Also please excuse the placeholder audio for the time being if you recognize it. Once I got the special capture abilities it was pretty easy to keep the counters up, but getting there was painful since it's easy to drop someone here and there when you don't have homing/vacuuming capture abilities. Seems harsh to have all the counters drop entirely from losing just one human, since the ones that fall do so rather quickly and your own movement speed isn't very fast, compared to, say, Dangun Feveron, which also drops your chain with a single missed discoman but gives you a lot more opportunity to collect them. Once you have one or two women with special capture abilities then the tendency is to just ignore powering up the rest and just use those to capture for the rest of the game. Maybe that's not so bad since they do block bullets and serve as a bit of additional firepower, but I wanted to point that out. 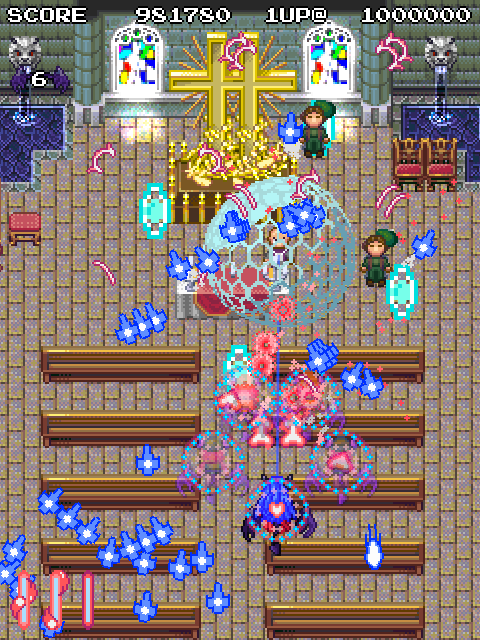 The enemies are at their most aggravating when they fire at you point-blank or as they're scrolling off the bottom of the screen. I especially had a lot of trouble with those guys who fade in and out. Screw those guys, I have no idea what to expect from them. What are your plans for extending the current power/capture ability system into a longer game? Are there going to be stuff like more capture abilities? Are you going to raise the threshold before you get the special abilities? Looking forward to seeing more updates. Keep us posted! I'm taking after Raizing medals mainly. Not the friendliest, I'll admit - I may uncouple scoring from powering up in future. Plus when fully-powered succubi capture, the others get powered up. I plan to avoid unfair shots later. Fading in and out is a sort of stand-in for an eventual cover system for those guys. There is a way to draw them out of cover more frequently. Hint: it requires more than one of them onscreen. I am thinking about how you could power up weapons, and how you could raise the max squad size (could be as simple as getting everyone to full power). Loving the snes style graphics! Thread subbed for sure. Demo updated to 0.1.1. (The previous demo is considered 0.1.0.) Some balance changes and visual improvements. Minor but helpful graphical updates and rebalanced stage 1. -The game's general theme is pretty interesting with an original premise and weaving the whole succubus idea into the powerups and ennemies is clever. -The pixel-art graphics look good. I feel like the popcorn human ennemies could do with a bit more personnality but it is no big deal. -Enemies shouldn't fire when too low on the screen. You don't really have time to react and it doesn't feel too fair. -The red shirt guys chase you for way too long. I would tweak their homing behavior to stop chasing you after a while and simply keep on going in the last direction they were moving in. Also, theses enemies can hit you even when low on screen and at point blank. I didn't even realize I got hit by one the first time around as some spawn very low to begin with. -Focus mode automatically picks up bombs when I have lots of helpers. However, I actually like having to move all over the place to collect them and this encourages to stay in one place and not put oneself in risky situations. I would change that to either remove the auto-pick up or make it so that the auto-pick up occurs when I am not shooting. This way, there's still some risk-reward involved in the mechanic. -Boss 1 is slightly too long given the number of patterns she has. Either give her one or two more patterns or reduce her health by a third or half. In any case, you've got a nice game there! I plan to "eventually" get some artist help to make humans look more villainous and combative, most importantly giving them visible equipment and attack animations. To make low and point-blank shots fairer, I'd like some flashy effect(s) for attack tells, but haven't decided what they would look like. It is planned for the melee guys to flee, but I ultimately put off the implementation for later. Them being on the ground, with obstacles that they should run around, adds a tiny bit of complexity. My implementation starting point will be putting exit paths for them. It's possible that with the addition of always-onscreen item icons, the longer pickup range powerup may now feel slightly excessive. But it is fun in a "shove your favorite food down your gob" kind of way. And it's active only during slow movement, so more high-volume or fast bullet attacks could balance that out. 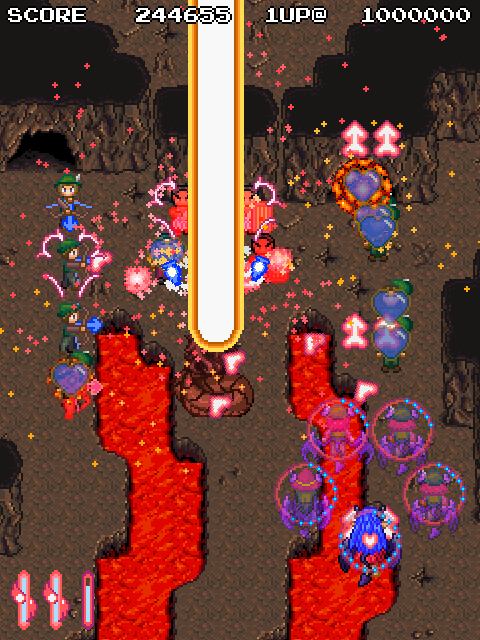 The tutorial is for showing at gaming events where the crowd is not as experienced in shmups. (was at https://landiego.com/lds8/ today) Also dpads that are considered hat switches are finally supported. -Is there any way to rebind inputs? -The bomb doesn't seem to give you invincibility, or if there is one, it isn't instant. That can be a design choice, though I once managed to game over on the first boss while firing my bomb, but the bomb seems to have killed the boss afterwards, so despite the game over menu appearing, I was then sent to the next level. -Boss 2 seems easier than Boss 1. Actually dodging the first boss' patterns does not seem too hard, but the speed at which it fires and the fact that you sometimes have to take into account the yellow and the blue arrows at the same time can lead to a few deaths. Maybe macrododging is the better strategy but the length of those arrows instinctively discouraged me from doing that. That's still a good boss though! -I probably already mentionned this, but have you tried removing the servants' ability to automatically pick up items when you focus? Moving all over the place to grab them sounds more fun to me. -Do the bosses time out? I let the boss 2 live for half a minute after all its minions were no longer there, but it seems to stay alive. At least there doesn't see to be infinite milking, that's good. Overall, I like the game and its fast, arcade-y pace! Enemies immediatly showing some aggressiveness without being overly punishing, and stages and bosses never outstaying their welcome are both great. It just feels good to play and is never dull. Thanks. Input binding and other options should make it in but no idea when. I intend for the bomb to be more of a super attack and less of a get out of jail card. As for the double KO with the boss, I just need to handle that properly and have the game over block the stage clear. I like your earlier suggestion similar to Studio SiestA games, of sending out partners by not firing. (In my case probably best when focusing and not firing.) I appreciate the thrill of manual pickup as in Raizing Yagawa games but this game is all about the pickups and various ways to get them, and then I need some other way partners can be lost (maybe they die with you and are replaced by reserves if you have them). This could be a good case for having a "ship selection" (not really different characters, just different playstyles) at the start. Slow move and easy pickup, or fast move and manual pickup. I probably should time out the bosses but rather than just leaving, I would prefer they escalate their final attack to the limit of what's reasonable. Last edited by Iori Branford on Fri Jun 15, 2018 11:28 pm, edited 2 times in total. Also forgot to post the new version here. Introduces rescuing civilians.